Bewitched by her beauty, he can't possibly kill her. Vampire Zak Smith has one mission: kill the enemy. The only problem is that everything about her draws him in, questioning his duty. With his vampire clan at war with Cadence Hopewell's witch coven, he's torn between his family and his desire. But when Zak and Cadence are catapulted together into the past, they must rely on each other for survival. Suddenly, danger surrounds them and Cadence must tap into her unstable and shaky powers. As they uncover the truth about their families and their history, can the two sworn enemies find love and a future together in the present? I read this story when it was still just a fanfic and I loved then and I love it now. The characters are beautiful and the story it's romantic yet compelling. 5.0 out of 5 starsWOW What a Ride! Zak is a vampire - one of the very first vampires. Cadence is a witch. His family and her coven have been at war for centuries, but they are VERY attracted to each other. 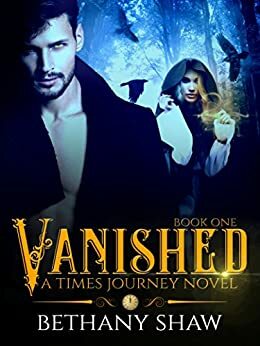 Her coven resurrects his mother to try to defeat his family once and for all and his mother uses a spell to send him back in time. The problem is, she sends Cadence, TOO. Zak and Cadence must not just survive over a thousand years in the past, but they must determine how to get back to their own time while dealing with their attraction for each other. Add in his father, who tries to kill her, and everything else they must deal with to survive (food for each of them is a REAL problem at times) and this is a fun read! I'm really looking forward to the next one! Ok I've read Ms Shaw's stories before and loved them...this one is no different. Her characters are really good and interesting but most of all Zak is loveable! (Just don't tell him I said so!) Cadence is so cute and funny. To be lost back in time must be scary but at least Zak has lived in those times before. Great storyline, great characters...what more could you ask for! Definitely recommend it and now to read the next in their journey. I enjoyed the writing style of the author. There was just enough build up on each character to keep the reader interested. Mystery, romance, and intrigue. She kept you wondering what would happen next, not like some books, where you can predict the outcome. I enjoyed the first book, hope the next books are as good. I recommend this book, enjoy!! Just finished reading this book,and I want to say that I enjoyed it, but the heroine was to whiney for me , it seems that every other word she says is to complain about one thing or another, " oh poor me, I can't love this monster or I stop Don't come near me but I want to kiss you" girl get ave so much whiplash from her about turns, but I will read the next book, helpfully it's better. 4.0 out of 5 starsBook #1!!! Vanished is the first book in this series and is a bit sluggish at times...I do however feel that as the plot and characters gained momentum that this series has incredible potential. I am looking forward to book #2. I recommend.